Yasur is one of the most charismatic volcanoes in the world, with a history of repeated strombolian and vulcanian explosions that have been continuing for centuries. 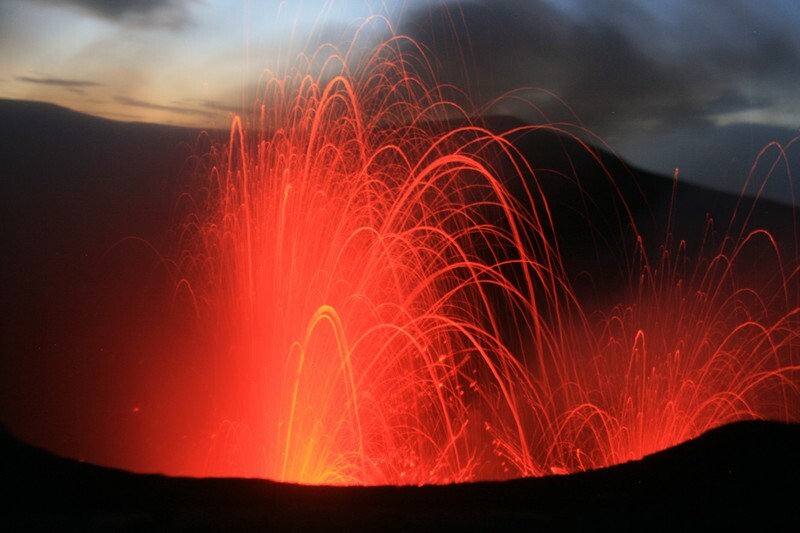 Yasur, on Tanna island, Vanuatu, is one of the active volcanoes of the New Hebrides arc, which has formed where the Australian tectonic plate is subducting beneath the Pacific plate. Yasur lies on the Pacific plate. How does Yasur stack up as a Top Trumps Volcano? Explosivity (Volcanic Explosivity Index) – 3. The explosions at Yasur are often dramatic, scattering blocks and bombs away from the crater, and sometimes they are large enough to release ash plumes several kilometres into the air. Height – 361 m. You are unlikely to win with this height! Yasur is actually just a small active cone within a much larger and more ancient volcano, Yenkahe caldera. Deadliness – 1. Yasur is a nuisance, sometimes dropping ash across parts of the island of Tanna, or out to sea, but in its current state of activity it is only dangerous to people who venture too close to the crater. Wow factor – 80. For many people, this is probably the ‘typical’ idea of what an erupting volcano looks like. Unpredictability – 7. Its current state of almost continuous activity means that Yasur’s unpredictability is quite low. The Government of Vanuatu have a Geohazards Observatory, with information about all of their active volcanoes. There is also some introductory information on VolcanoWorld. Because of the relative accessibility of Yasur volcano, there is a lot of wonderful video footage of the eruptions at Yasur. Some of it is completely daft (there really is no excuse for climbing down inside an erupting crater); this video captured from a drone gives a very good idea of the activity.